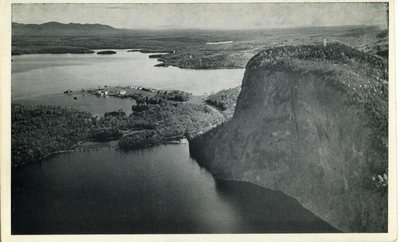 "Mount Kineo, Maine, Lover's Leap "
This black and white photo printed on the front of a postcard shows a view from the top of Mount Kineo. In the distance, one can see the Kineo Hotel House along with Moosehead Lake. No date is given. Published by Luther S. Phillips, Box 6, Bangor, Maine, and labeled as number 514.